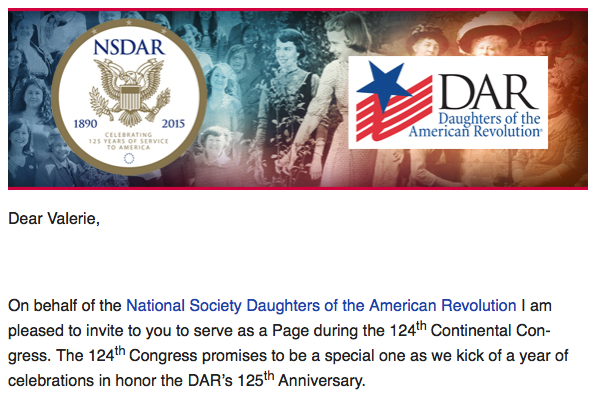 One aspect of my membership in the DAR is the fact that, as a woman under the age of 36, I am a Junior. This doesn't mean that I'm a second class member, but is a way to give special significance to younger members. As you might imagine, the average age of DAR members is in the 50s and 60s. However, the Society greatly appreciates their younger members and the skills and passion they bring with them. Part of being a Junior is the opportunity to be a Page at conferences, both State and National. I haven't taken part in this aspect of the DAR yet, but those who I've spoken to who have paged really seem to have enjoyed the experience. It seems to encompass many different tasks, from hostess and hospitality, to errand runner and guide, to ceremonial participant. And you do it all while dressed in white from head to toe. Back in the fall I had planned to page at my state conference, but my work schedule would not permit it. I decided to go for broke and attend the national conference, the 124th Continental Congress, in Washington, DC. I've never been to DC before and this seems like a great opportunity. I'm joining other chapter members and other Daughters from Georgia on a state bus trip. I have to admit that it's not an inexpensive trip, but I think it will be more than worth it. Today I received my official invitation to page at Continental Congress. I need to indicate which days and times that I am available to page, as well as some skills that might be of use as a page during the conference. I'm going to wait to fill out the form for a few days and get advice from other chapter members during our next meeting. After sending in my RSVP, I will receive more information about my assignments. Until then, I'll be pursuing the calendar of events, exploring maps of DC (our bus is taking us in early so we'll be doing some sight seeing), and shopping for all things white. I do so love to over-plan. congratulations- hope you enjoyed last year - are you paging again this year?